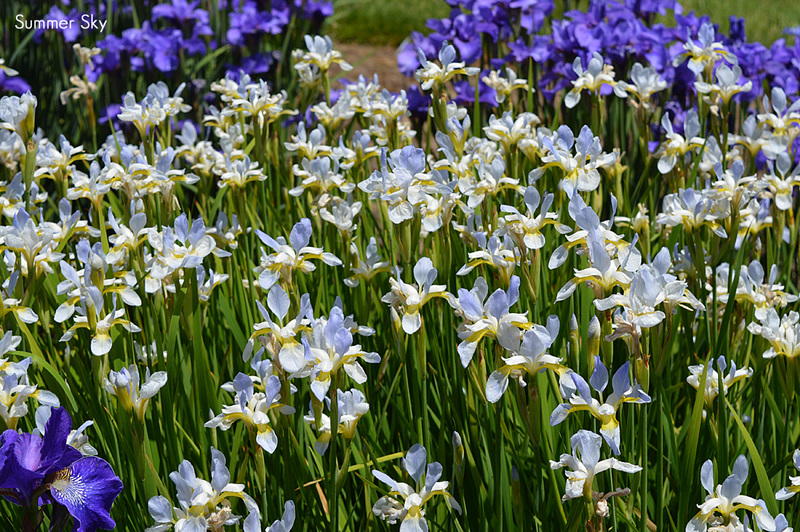 A small sampling of Siberian iris photos I've taken in years past showcasing the beauty they bring to the garden. 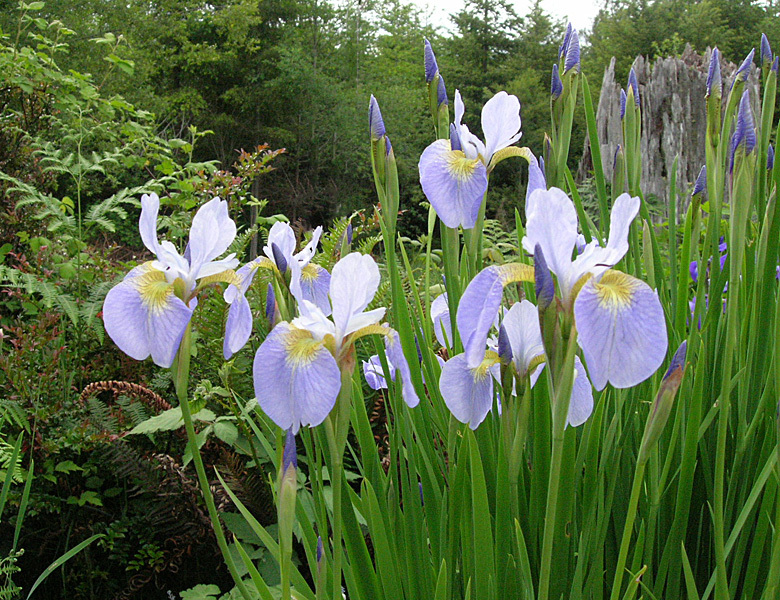 Siberian irises make exceptional garden plants and are easy to grow and care for. They are especially beautiful when grown in large masses. For many decades the color range was limited, but recent advances have opened up entirely new color classes for them and amazing new varieties appear every year in reds, golds, pinks, oranges, browns, and blends. New forms and patterns are being explored by hybridizers as well, including multiple falls, heavy ruffling, and edge bands that give a plicata effect. Exciting times for fans of this iris species. When I first started growing Pacifica Iris from seed, I collected several pods too early. The seeds were not fully developed, and resulting germination rates were low. There were also the usual vole, jay and squirrel problems—these animals being all too willing to eat germinating seeds. Come forward a few years; this year I was late gathering seeds, due to trips, work, and other commitments. What seeds I did collect were heavily colonized by fungi, despite a dry long summer along the Pacific Northwest coast. About half the seeds were composted due to fungal coatings. In many pods the seeds were completely felted together with fungal filaments. All of this left me with a complex about the right time to gather ripe Iris seeds. I asked for advice among a number of SPCNI members, thinking I must not be the only person who has struggled with ripening, predation, and fungi, and several people responded with comments and photos, including Debby Cole and Bob Sussman. I thank both of them for their helpful notes, and Bob for taking time to send photos. Label wrapping a pod that is close to being ready. Photo by Bob Sussman. Timing of seed ripening is based on tracking pod appearance. Pods go from skinny green to plump yellow and then brown. Six to seven weeks is the usual incubation period after flowering. Species often ripen quickly, including Iris tenax, I. innominata and I. thompsonii, which all may have yellowing and opening pods in five to six weeks in warm climates. A slight opening of the pod tips may appear when seeds are ripe. This varies from ‘never opens the slightest’ to ‘splits wide open and tosses seeds out’. The latter usually happens when I’ve been inundated with visitors, trips or work and do not have time to gather pods. Organza bags can help contain the seeds, but don’t leave them for weeks, or the bags will be chewed through and the seeds removed. Open pods, some seeds have already shed. Note the withered flower, still attached, lower left. Photo by Bob Sussman. The corollary to ‘never opens in the slightest’ is that those pods may need to be cut open to free the seeds inside. 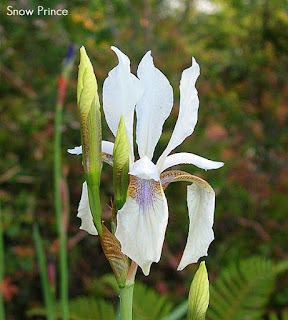 Some Iris douglasiana pods have this character. They go from green to yellow, often with a ‘shrink-wrapped over the seeds’ look, and then to plump brown, by which time the pods are woody, hard, and require tools to open without shedding blood. The worst of this lot are also the last to flower and thus to ripen seeds each summer. When ripe seeds are left too long, they will be discovered by voles, crows, jays, and various molluscan and insect seed-eaters. The only solution is to get to those pods ahead of the seed-eaters. Fungi appear to grow in the pod tissue and seed coats, and not in the seeds. I’ve had healthy seedlings grow from seeds heavily covered in fungi. But we can't seen around seeds that have visible mold. Biosecurity is getting tighter all the time. If we gather seeds at the right time, and reduce/eliminate fungi thereby, this helps reduce the chances that seeds will be rejected by inspectors. Viable fresh seeds, just released from the pod, which is still green. These seeds will dry to dark brown. Photo by Bob Sussman. Note the absence of fungi on these seeds. As for color, that is a feature of the moisture content of the seed. 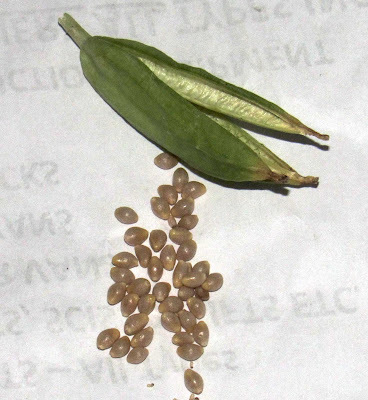 Fresh, viable seeds are very light brown, and dry seeds are dark brown. 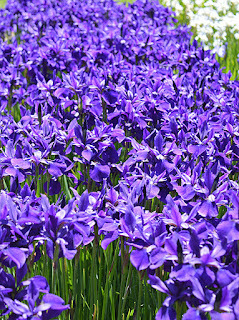 In the spring on my trip to Oregon and Washington for the joint Region 13/TBIS meeting, I had planned to spend the day after the meeting in Oregon at Mt. 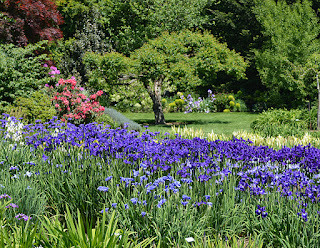 Pleasant Iris Farm, then at Aitken’s Salmon Creek, and then the evening with my niece and her family. Sunday morning, I got on the road only to find the rental had a leaking tire; Thrifty did a quick exchange of vehicles at the Portland Airport and I arrived mid-morning at Mt. Pleasant. 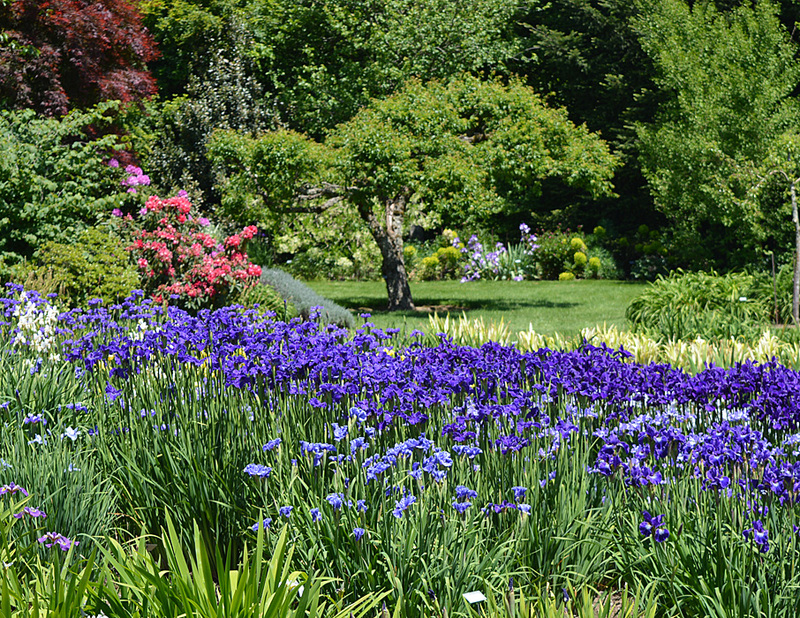 Seeing that Chad and Dale were both busy, I headed for the irises. 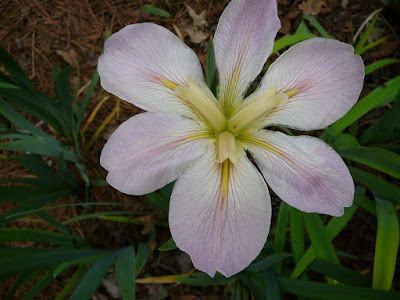 Almost at once, Chad Harris came up and wanted me to go up the hill to the patio and to see a new iris species he had in bloom, especially since one flower was fading rapidly. 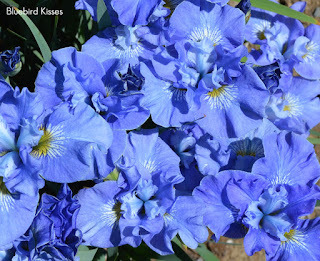 At this time the new species does not have a botanical name and goes by the garden name of ‘Azure Blue’. Chad had two specimens blooming in pots and there was enough difference between the two clones to see that they had been raised from seed. One of the most interesting things about this new species is the notches in the standards that locks the standards in place. Right now the goal is to obtain more seed so more growers can propagate the plant. 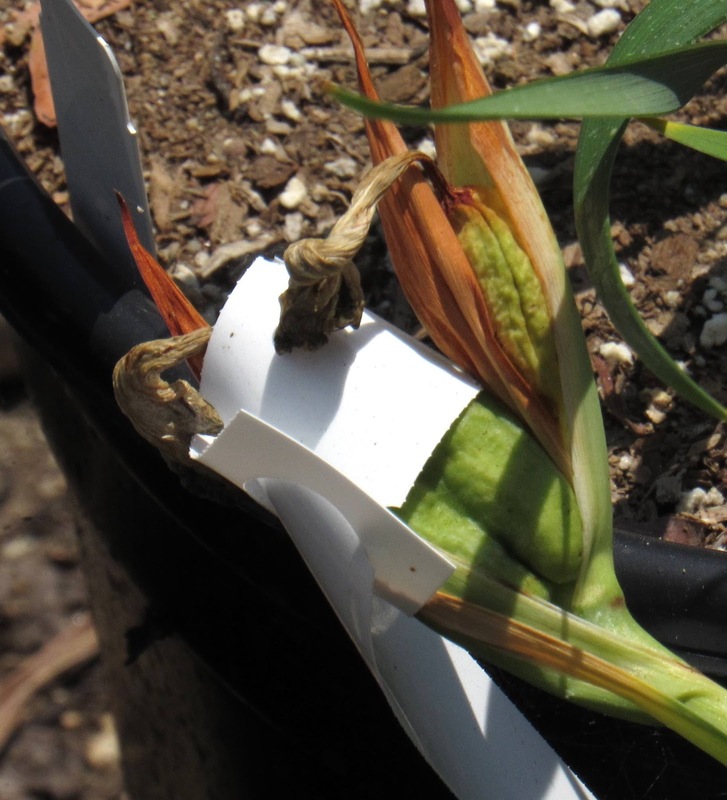 Later down the line, the hope is studies will be done to see where it fits into the genus iris. 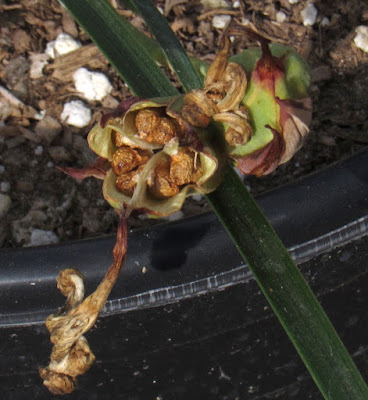 The current thinking is that it is an unknown species of crested iris most likely related to I. milesii and I. tectorum; however, it has resisted setting seed with either one of these groups. The stalks had two flowers in the terminal and one flower in the side branch. This new species was one of the highlights of my Oregon and Washington trip. It is not every day that we get to see a new species live and bloom. The background of this iris is also interesting. It comes from the least populated states in India, Arunachal Pradesh, and borders Tibet, Myanmar, and Bhutan. The climates range from subtropical to alpine and even tundra. Travel to the state is not easy, but in 2009 the plantsman Peter Boardman went on journey through the state. 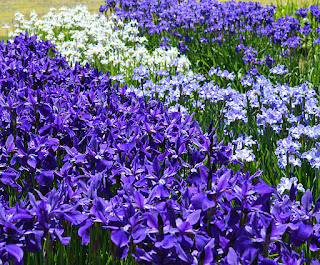 There he took pictures of an unknown iris. In 2014 a collecting trip was made, plant material collected, and then that material sat in the post office and customs and was destroyed. Until I made the trip this spring to Oregon, I was not aware that seeds had made it to the United States. We should consider this a developing botanical story with the next chapter yet to unfold. 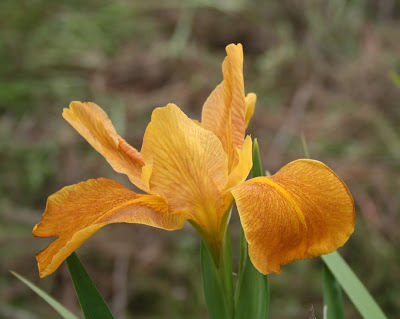 I have written previous “blogs” about the diversity of color in Louisiana iris blooms, in which we looked at specific colors. 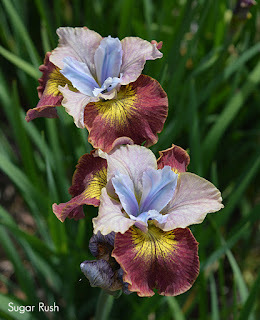 Today I want to show you some of my favorite “unusual color” irises. I use the term “unusual” but could use “odd” or “strange” instead. Of course, what I call “unusual” someone else would call “normal”. So, let us just say I find them to be “unusual” colors or colors not often found in Louisiana irises. That does not in any way imply that I don’t like them. I think my comments below will prove otherwise. ‘Annette Brown’ (Harry Wolford 2013) is registered as bright yellow stands and bright yellow, heavily veined, falls. The pod parent is ‘Splitter Splatter’ (D.R. Graves 2004), which has unknown parents. ‘Splitter Splatter’ is shown below. 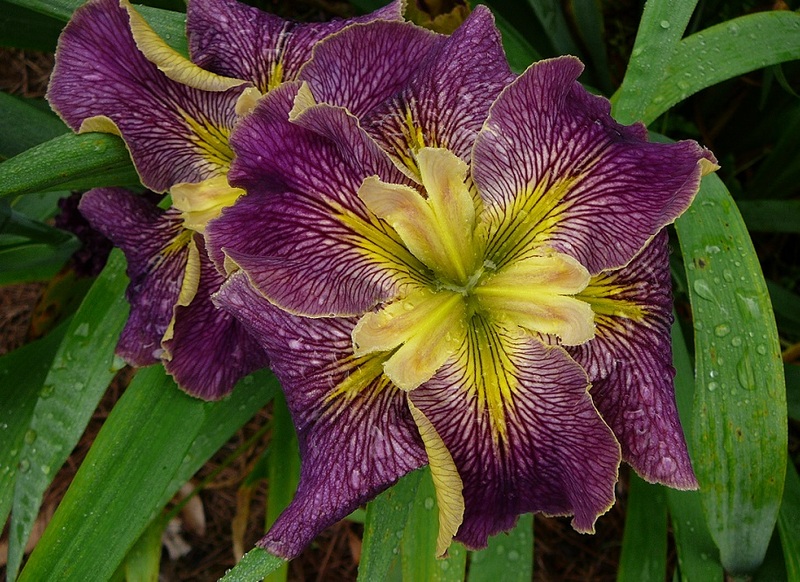 The pollen parent, also shown below, is ‘Bayou Tiger’ (K. Strawn 1993). Neither of the parents are even close to the same color as ‘Annette Brown’. ‘Bayou Tiger’ is a favorite among Louisiana growers who are also LSU fans. The colors are very close the LSU tiger colors. 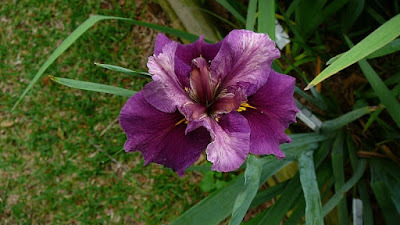 I have a hard time keeping enough of this iris because every person who visits wants some of it. 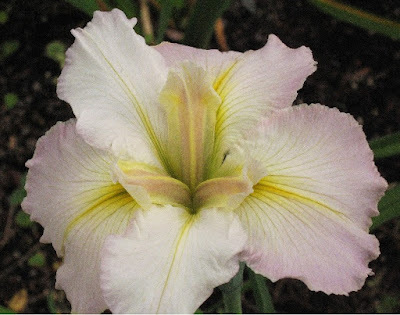 ‘Birthday Suit’ (Patrick O’Connor 2010) is a very pretty pale pink iris with cream/yellow style arms with almost white falls with a pink overlay. It is very distinctive. The pod parent is ‘Honey Star’ (J. Hutcinson 1991), which is more cream and buff wine colored. ‘Honey Star’ is one of my favorites and comes from Australia. 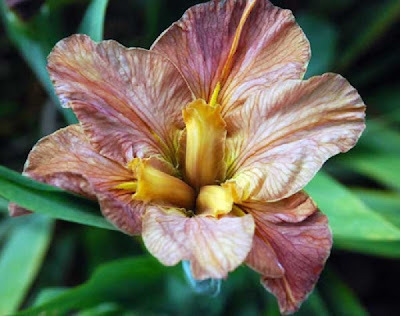 ‘Bryce Leigh’ (Frank Chowing 1973) was a real breakthrough with the color and unusual signal, which is golden with maroon bordering the signal. 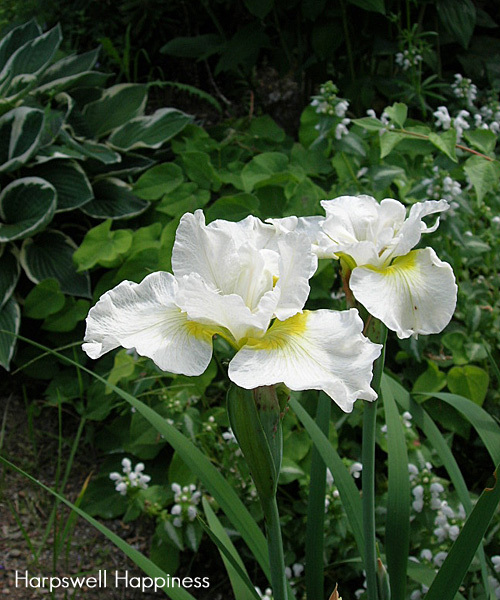 It won the Mary Swords DeBaillon Award (MSDA) in 1981, the highest award for Louisiana irises. ‘Chocolate City’ (Patrick O’Connor 2011) derived the name from hurricane Katrina, which almost wiped out south LA and MS. Those around and keeping up with the news during that period (August 2005) can figure out where the name originated. It is registered as stands and falls beige with rose undertones. It is certainly an unusual color. Patrick has hybridized some amazing irises but simply does not get the awards credit he deserves. 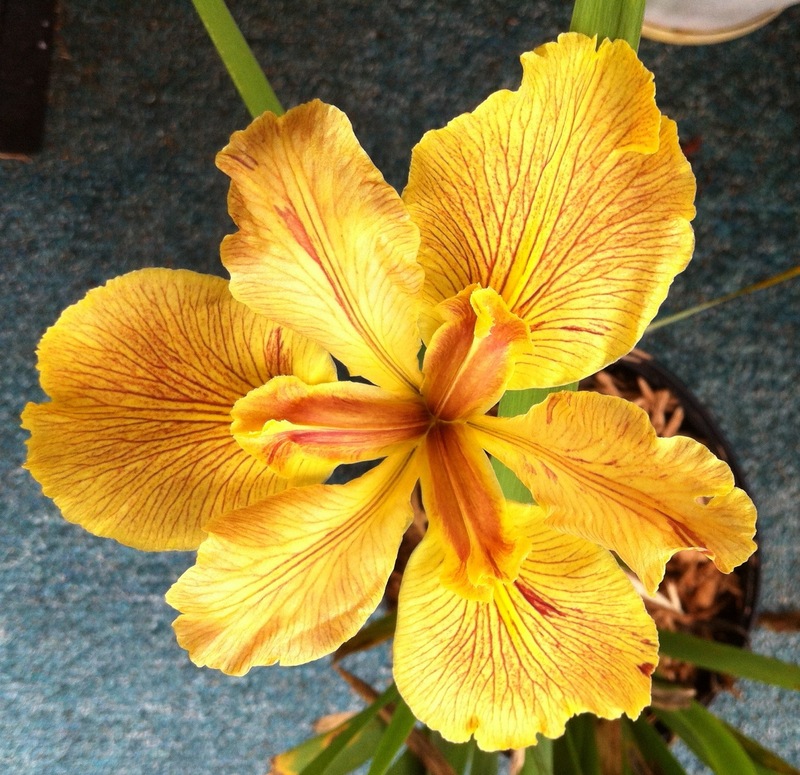 ‘Dashing Hero’ (Heather Pryor 2004) is another fantastic iris from “down under”. Heather and Bernard Pryor have produced a lot of beautiful irises in Australia, unfortunately it is almost impossible to import any living plants into that country. The pollen parent is ‘Our Dorothy’ (Bernard Pryor 1997) and I suspect most of the coloring in ‘Dashing Hero’ came from the pollen parent. ‘Divorcee’ (J. Ghio 2001) is darker in the registration picture but the unusual signals are shown in this photograph. The registration describes the signal as “deep rose stripe from end of lime line signal”. The standards are apricot, edged brushed melon and the falls are melon rose. 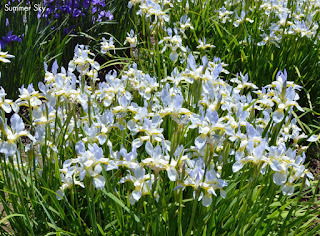 ‘Flash Harry’ (Penny Davis 2008) is another iris from Australia. 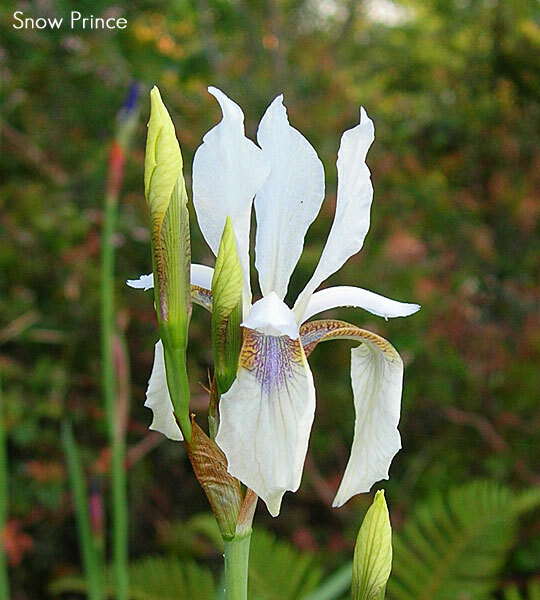 It has not received wide distribution but is certainly an “unusual” iris. It is registered as “wine red” and is a beautify to behold. ‘Foxy One’ (M.D.Faith 2003) is one of the lighter colored irises but it maintains the color well as the days progress. 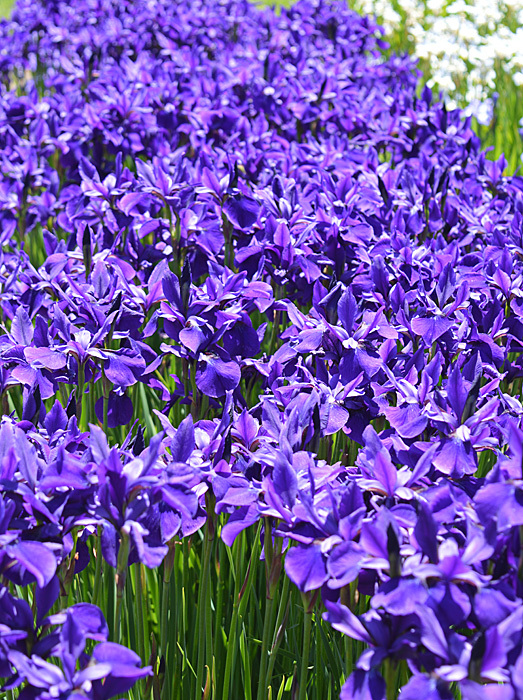 It is registered as violet to light violet. It has a beautiful signal with dark violet surrounding the signal and the petals are veined with a darker, almost red, veining. MD hybridized a lot of lovely irises. ‘Heavenly Glow’ (Richard Morgan 1988) is an older iris but still one of my favorites and an “eye catcher” from way across the garden. It is registered as “orange red with yellow steeple signal and green style arms”. Sometimes colors are hard to describe. What was not described is the beautiful signal, an orange steeple signal surrounded by a darker “red?” with the same color veining on the falls. It did not receive any of the AIS awards but often wins show awards. ‘Honey Galore’ (Ron Betzer 1999) is registered as orange buff with orange buff style arms that are infused black and green toward the base. That is a good description although I readily admit I am not very skilled at determining colors, other than basic colors (red, white, blue, green, etc). 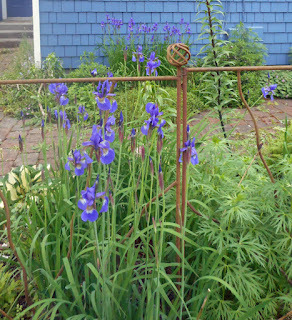 ‘Hush Money’ (Mary Dunn 1998) has always been one of my favorite irises. 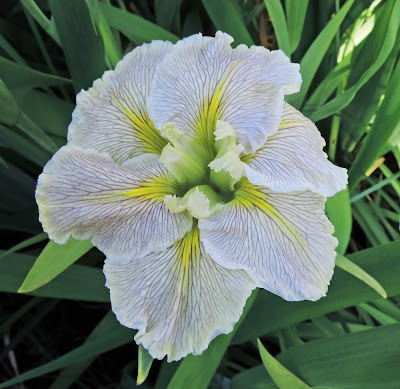 It is registered as “stands cream with blue cast, falls cream, raised gold line signal”and that does not come close to describing this beautiful iris. 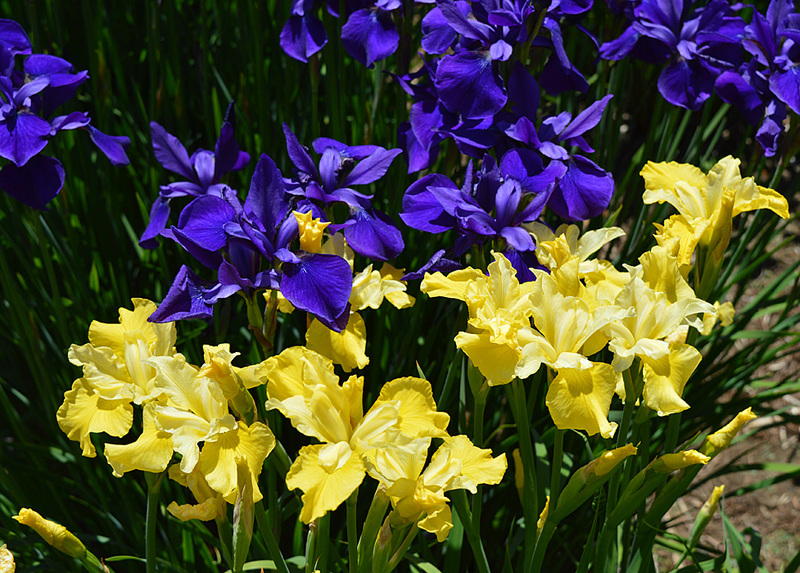 First of all, it usually has smaller foliage and flowers than a lot of Louisiana irises. The stands tend to stand up, although not straight up, more like 45degrees, and the falls tend to gracefully curve down. 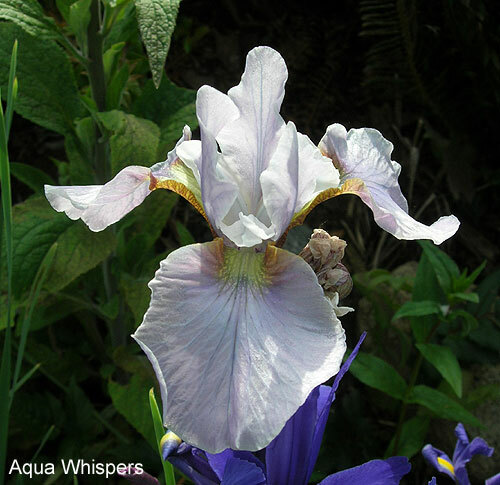 It is impossible not to love the iris and the name. It won a Honorable Mention in 2002 but never progressed any further in the AIS awards system. 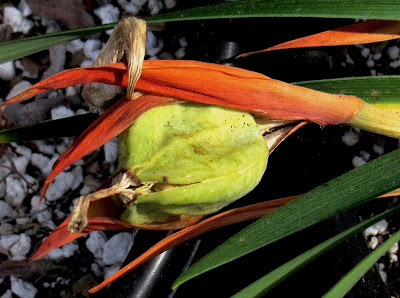 iris.fulva dwarf – I wanted to post this picture because the flower of this species of Louisiana irises has an “unusual” color. There are plenty of red flowers in the species of Louisiana irises but this one attracted my attention because of the deep black spot where the style arms meet, and because of the red “splotches” and veining. An interesting example of i.fulva. 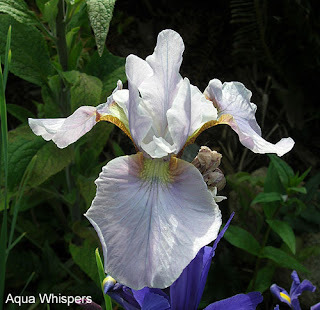 To learn more about the species of Louisiana Irises just visit this website. ‘I Remember You’ (Harry Wolford 2004) is registered as “light rose pink with falls darker rose pink”. There is a lot more than that going on in the stands of this iris. The pod parent is ‘Atchafalaya’ (Farron Campbell 1998). 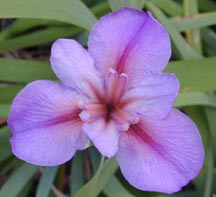 ‘Atchafalaya’ is a cartwheel form in dark red violet and that may be where the color was passed on to ‘I Remember You’, although their flower forms are different. ‘Katrina Dog’ (Patrick O’Connor 2009) is one of the few irises I can find that is registered as “light tan”. The registration reflects “light tan standards, light green style arms with tan tips, tan falls and yellow arrowhead signal, veined brown, moderately ruffled”. 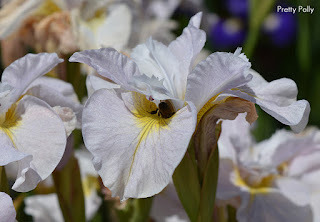 Again, color is subjective and although I can’t tell you what color this iris is, it just doesn’t seem “tan” to me. There is a very interesting story behind the name. Ask Patrick O’Connor about it if you meet him at a convention. I love irises with a meaningful name. ‘Little Woods’ (Patrick O’Connor 2004) is one of few irises registered as pink. The bold style arms, the deep dark center of the styles, the wine centered veins – there is just a lot going on in this flower. ‘Louisiana Fascination’ (Charles Arny 1969) is another iris registered as pink. It is certainly of the older open form and the registration is simple, “dawn pink self”. The pollen parent is ‘Her Highness’ (Levingston 1957), a collected i.giganticaerulea that is a white self. ‘Mister Sandman’ (Harry Wolford 2007) is certainly an “unusual” color. It is registered as “pale yellow dusted burgundy at the edges”. 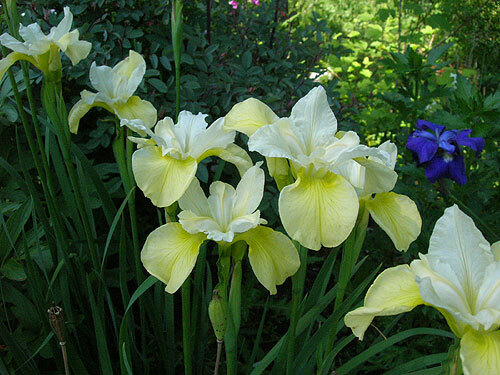 It is certainly an eye catcher and a welcomed relief from irises that are just yellow. ‘Miss Gertie’s Bonnet’ (Dorman Haymon 1999) is a beauty. You have to love the name, named for Dorman’s Aunt Gertie. He said it reminds him of the hat shore always wore in the garden. Registered as cream stands and lavender falls, it is certainly a little more complex than that. It won an Honorable Mention in 2005. 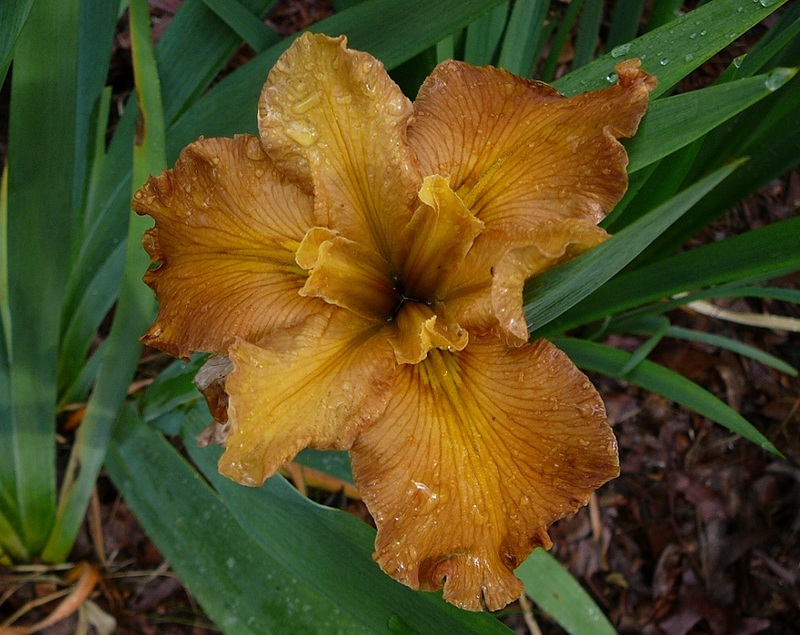 ‘N’Orleans Flambeaux’ (Rusty McSparrin 2013) is registered a “yellow” but it looks more orange to me. I love the color, whatever it is, and the form with upright standards and flaring falls. Another beauty – but aren’t’ they all? ‘Nadine Sarah’ (D. R. Grieves 2016) is another iris from an Australian hybridizer who has produced many beauties. 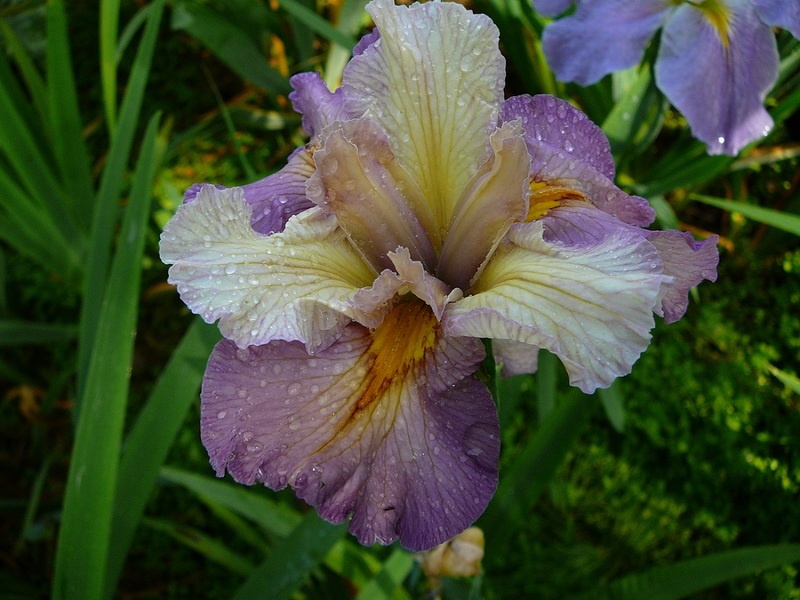 It is registered as “pale violet” with fine veining. It certainly has lots of veining. The style arms are eye catching. Let’s face it, there is a lot happening in this flower. ‘Pink Poetry’ (Henry Rowlan 1987) is another beautiful pink iris with outstandingly beautiful signals surrounded by a darker, almost red, color with creamy white style arms. Quite an unusual iris for 1987 and still a beauty today, some 30 years later. ‘Splitter Splatter’ (D. R. Grieves 2004) is an “oddity” in anyone’s book. The splotches of color vary from flower to flower but are always present in some form. Again, how do you describe something like this for registration purposes? 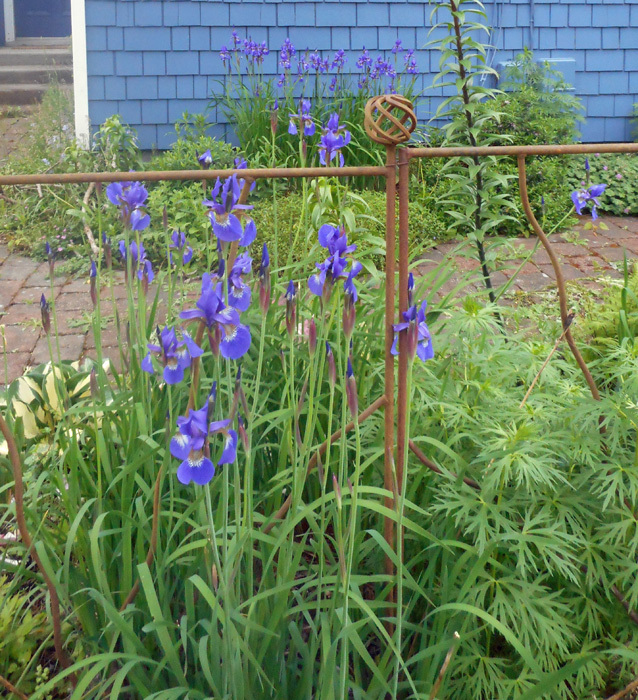 I love this iris and try to keep it growing in three or four different beds. ‘Summer Symphony’ (Heather Pryor 1997) is registered as lemon stands and yellow falls but described as “soft lemon stands, burnt red blush on edge, style arms apricot lemon, falls yellow base with terra cotta blush at edge with lemon rim”. It is certainly all of that and much more. Ya gotta love it. ‘Tchoupitoulas’ (Patrick O’Connor 2002) is really, in my opinion, odd! 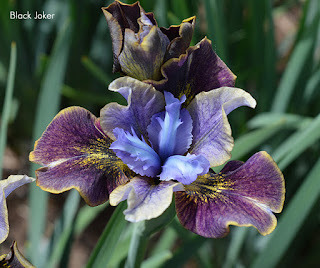 The colors are different from just about any iris I have photographed. Pronounced CHOP-i-TOO-las, it is a street in New Orleans, LA, and comes from the name of an extinct Indian tribe. Patrick has named many irises for many things in South Louisiana. To me the distinctive and “unusual” signal, described as “red violet”, is the most remarkable part of the flower. The flower is certainly a thing of beauty and the name is really “unusual” also. Patrick used to own Zydeco Nursery in Metairie, LA, so what can I say? He lives close to the Atachafalaya Basin. His tongue must stay twisted. ‘Under Radar’ (Patrick O’Connor 2011) I just realized that a lot of these “unusual” irises were hybridized by the same person, whose name we won’t mention. No, Patrick is a great person and a hard working member of the Society for Louisiana Irises. ‘Under Radar’ is registered as “yellow stands and amber falls”. They look more orange to me. It has beautiful green style arms and a “green dagger” signal surrounded by a yellow “sunburst”. The linage is really complex. Check it out if you have access to the registration information. ‘Venus Vortex’ (Heather Pryor 1998) is really something! It would be hard for anyone to describe everything happening in this iris. I really like the white spray pattern on the petals. It has the same pod and pollen parent. Unusual, yes - but I love it. 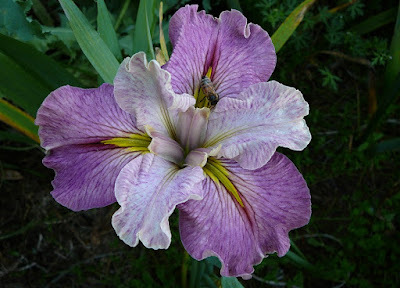 ‘Rooster’ (Ron Betzer 2013) is certainly an “unusual color” for any flower. It is registered as “yellow” but I see many more colors in the petals, especially the falls. It has serrated edges on the petals while the signals are barely visible among the falls, which are almost as golden as the signals. How can you describe such a beauty? It won an Honorable Mention in 2017. 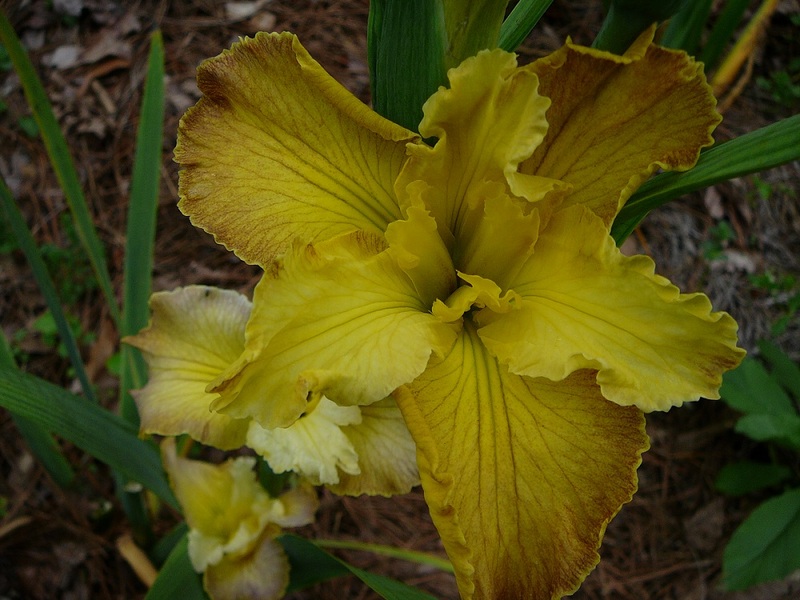 To learn more about Louisiana irises, visit here. 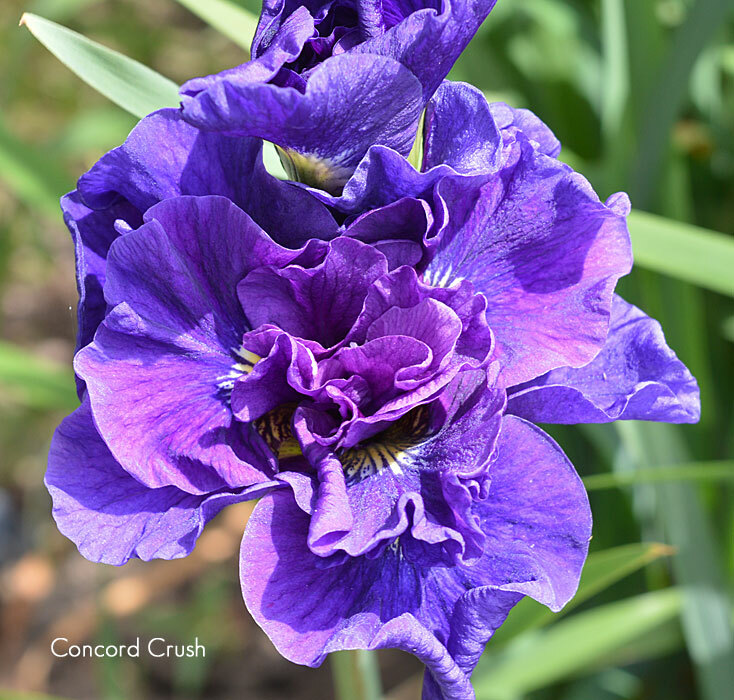 To learn more about other irises, visit here.